This week's topic from The Broke and Bookish is Top 10 Book Club Books. I'm lucky to belong to the best book club ever: The Not So YA Book Club, for readers who are adults, but still enjoy reading YA. It's hosted at one of my favorite book stores, Little Shop of Stories. Sign me up! 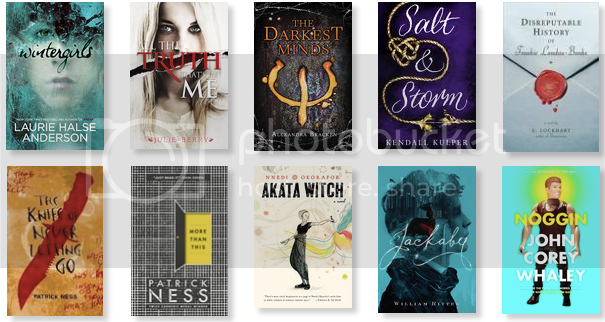 lol I want to read all of these... especially Jackaby, More Than This, and The Darkest Minds. Jackaby was so good. I could definitely see the Doctor Who influence. More Than This got off to suuuuch a slow start but it picked up eventually. The Darkest Minds was very much a road-trip book.